An appreciation of the development and interconnections of religion, culture, family and business in Saint John’s Jewish community within our community at large has been enhanced for locals and visitors. 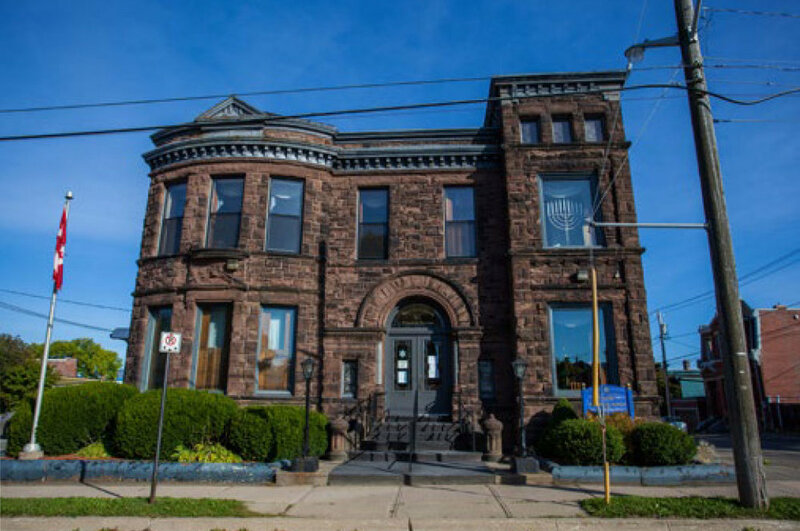 The mandate of the Saint John Jewish Historical Museum is to collect, display, preserve articles related to Saint John’s Jewish community, educate and provide a research facility for genealogists, historians, and religious scholars. The Saint John Jewish community dates to 1858, with the arrival of Mr. and Mrs. Solomon Hart from England. He opened a tobacco business and his community minded wife founded the Daughters of Israel, the beginning of a long tradition of socially minded Jewish groups. They opened the doors of the first synagogue in 1898 on Carleton St., an area where many Jewish families resided. The Jewish cemetery in East Saint John was already well established and is still in use today. A second wave of immigrants from Eastern Europe, escaping persecution, joined them; spreading along Main Street and within three generations went from peddlers to merchants to professionals. A second and third synagogue opened as the years and religious practices evolved. Jewish families numbered over two hundred by the 1960’s. The Jewish community contributed greatly to cultural, economic, social and charitable life in Saint John. They gave back to their own and the community at large through many organizations such as Sisterhood, Hadassah, Young Judaea, Young Men’s/Women’s Hebrew Association, B’nai B’rith, Jewish Community Players, Boy Scouts, Cubs, Girl Guides, Brownies as well as Red Cross, Kiwanis and Lions clubs. The Shaarei Zedek Synagogue on Carleton Street was a beehive of activity with services and the Hebrew School. Marcia Koven gave twelve years to the Museum as its first curator. UNB recognized the merit of her research and collections and encouraged her during advanced studies. The Jewish Community Centre on Wellington Row shared space as her work expanded from collecting oral history to photos, records and artifacts, earning her an award in 1987 from the American Association of State and Local History. Permanent displays include the Hebrew School classroom, and “From The Cradle to the Grave” – a display focusing on the community’s history, religious practices and traditions. Changing displays explore aspects of the Jewish community’s lives and contributions: weddings, World War II service men and women, Bar and Bat Mitzvahs, local businesses, artists such as Herzl Kashetsky, David Silverberg, Dr. M.I. Polowin and Josh Beutel and notables like film mogul Louis B. Mayer; Judge Benjamin R. Guss; Mayor Samuel Davis, and Senator Erminie Cohen. An annual Holocaust remembrance service features a guest speaker, usually a Holocaust survivor. Dr. McGahan is emphatic about the calibre and value of such outreach programs as a way to promote tolerance and understanding. The Jewish Museum’s award winning library contains books in English, Hebrew, and Yiddish covering many aspects of Judaism and a significant collection of books on the Holocaust. The Louis I. Michelson Archives houses a wide variety of community records, which has also been preserved by the Provincial Archives. The Jewish Museum welcomes contributions to their collections. They developed and loan Jewish Educational Outreach Kits for students and churches about the Jewish religion, way of life and to create understanding, and partner with high schools. They explain: Sabbath, Rosh Hashanah / Yom Kippur, Sukkot, Chanukah, Purim, Passover, Jewish Lifecycles, and the Holocaust. In the mid-1980’s Marcia Freedman Koven embarked on a heritage project that changed her life and recognized our area’s Jewish community and its special place in our history. It has inspired many who have moved on from Saint John but trace their roots here. Serving the Saint John Jewish Historical Society today are: Dr. Elizabeth McGahan, President; Lorie Cohen-Hackett, Vice- President; Richard Osepchook, Treasurer; Teresa Goldsmith, Secretary; Dr. Joseph Arditti, Eyal Ekshtein, Ilanit Friling, Lloyd Goldsmith, Rev. Dr. Philip Lee and Katherine Biggs-Craft. The Jewish Community invites the public to visit them each December to celebrate the lighting of the menorah for Chanukah. There is no admission fee and Museum membership is modest. Donations to The Saint John Jewish Historical Museum Fund are welcomed and gratefully accepted. For information and group tours call 633-1833. Contributors who wish to support the Saint John Jewish Historical Fund are welcome to augment through the Greater Saint John Community Foundation.